Its well documented that identical twins who for one reason or another are separated at birth may meet up when they’re older to discover that their characters and experience has been bizarrely similar. This doesn’t necessarily prove astrology is at work as there might be a number of other factors that are genetic that cause these similarities. It is an interesting area of study for astrology, however and one example is of American twins Russell and Roger Brooks who were separated at birth, renamed and raised differently. Roger Brooks was adopted and raised as a much loved only child by an Italian Catholic family and was given the name Tony Milasi. Russell was placed in orphanages and foster homes up to age 4 but then going on to live with a Jewish couple, the father was his natural father. Bizarrely, Russell’s name was changed to that of his twin brother, Roger. In his early twenties Roger began tracing his twin brother. When they met, they became inseparable, finding how identical they were in tastes, responses, their IQ and behaviour. They sounded and acted alike, tastes were the same. They smoked the same brand of cigarettes, both bought special imported Swedish toothpaste and their eating and sleeping habits were similar. Both have bad scars on their left arms, Roger from burns, Tony from cuts. Both were double jointed, and had trouble with lower right wisdom tooth. They held a pen in the same way, and had the same posture and hand movements. Both men enlisted in the armed forces for 4 years within 8 days of each other. The chart for Roger is available but not for Tony, although the assumption is that the times would be very close and that they would even share aspects to the Ascendant. Capricorn Research has 242 charts of twins and the most common Sun sign by some considerable distance is Gemini ( the Twins ) with a score of 159% of the expected figure. 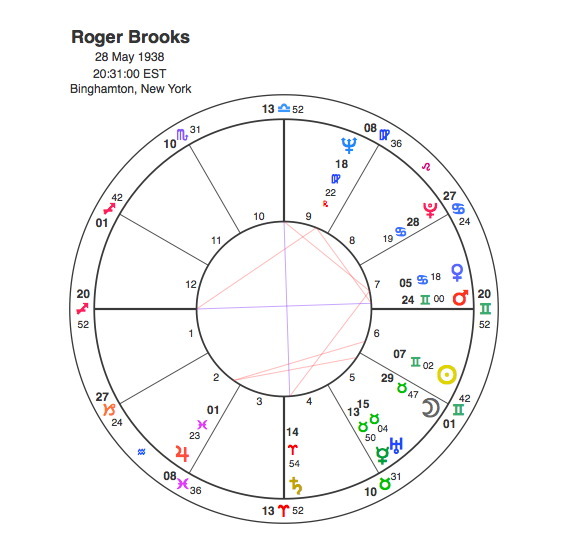 Roger Brooks has the Sun in Gemini and the Moon is at 29 degrees 47 of Taurus. Whenever a planet is in the last degree of a sign it is said to contain more of the following sign than the one it is actually in. So effectively we have a Sun and Moon Gemini. If Tony was born after Roger, he would be likely have the Moon in Gemini. The twins also have Mars in Gemini opposite their Ascendant. There are two distinct planetary patterns in this chart and both of them are saying the same thing. The only aspect that the Sun and Moon have is the square to Jupiter in Pisces. We can read the Sun and Moon in Gemini as the two twins and they are square ( separated ) Jupiter ( by a large distance ) in Pisces ( dissolving their relationship ). The other pattern is the Ascendant, Roger and Mars in Gemini his twin. These two are opposed ( pulling away from ) each other. The opposition forms part of a T Square to an apex Neptune ( again dissolving their relationship ) in the 9th house ( of long distance ). They are of course twins so Astrology has to spell it out twice. Its quite possible that all of the remarkable similarities that Roger and Tony shared could be cause by genetic factors but both joining the armed forces for 4 years at the same time ? People might dismiss this as pure coincidence or as some kind of unconscious telepathic relationship that twins have even over long distances. That in itself would be extraordinary but the interesting thing from an astrological perspective is the timing. They both enlisted in August 1955 and their time in the forces coincided with Pluto’s square to their Moon and opposition to Jupiter between 1956 and 58 triggering a dramatic change in domicile ( Moon ) and foreign travel ( Jupiter ). The turning point for both of them was in 1962 when Pluto was square their Sun. This was the year Roger traced Tony and they met in January 1963, from that point on they were inseparable. The started a business together and lived next door to each other. Roger and Russell Brooks were double Geminis separated at birth by Jupiter and Neptune. Pluto brought them together and they stayed that way.